You can pay your membership dues online annually or pay for the next two years. If you owe more than this year's dues, please contact Gene Walker @ ewalkerjr6@yahoo.com to discuss payment options. Here is our list of current events which need our help. Use the SignUp Genius link to let us know that you are helping. Sunday, August 11th. 3 pm tailgate with 5 pm Game time. The St Wenceslaus Knights of Columbus Council invites all graduating 8th grade students of the parish, who will be entering a Catholic High School in the area in the Fall of 2019 to apply for a renewable scholarship. The scholarships will be renewable each year the student continues to be enrolled in a Catholic High School in the area. A total of four (4) scholarships will be awarded. The amount of each scholarship to be awarded is $500 per year, for a total of $2,000 over four (4) years, assuming the qualifications for renewal are met. The award will be made directly to the Catholic High School designated by the applicant, on behalf of the recipient of the award. The criteria for renewing the scholarship is detailed below in the section entitled Criteria for Renewing the Scholarship. 3. An active participant in faith and / or charitable based programs offered through St Wenceslaus or a community based organization with clear goals which openly align with the beliefs of the Catholic faith. An example list of qualified eligible programs may be made available upon request. While this list will not be exhaustive, it will serve as an example of programs that applicants may use to determine eligibility. D. Written essay from student about how the service programs / activities they have engaged in have inspired their Catholic faith and prepared them to be a beacon of Christianity as they prepare for high school. (Examples are attached as a pdf Example of Service Activities) Students are encouraged to highlight specific actions/projects with which they have been involved with which demonstrate charity and love for others. The essay should clearly be written by the student, and contain approximately 200-250 words (a single page, if typed). Note that, while good grammar and punctuation are encouraged, these will not be used as evaluation criteria. 2. Completed applications should be placed in a sealed envelope addressed to St Wenceslaus Knights of Columbus Scholarship Program with the applicant’s name in the bottom left corner. 4. Deadline for application submission is 5:30 pm on Friday, April 26th, 2019. Service coordinators/mentors may be contacted by the selection committee to attest to the level of service and to describe how the program has positively impacted the student and strengthened their Catholic faith. 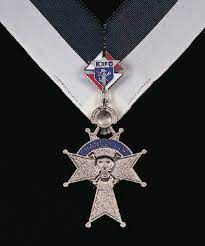 Preference for the awards will be given to a son or daughter or a grand-son or grand-daughter of an active member in good standing of the Knights of Columbus or the Catholic Daughters. Children of deceased members of the Knights of Columbus or the Catholic Daughters are also encouraged to apply. 1. The applicant’s name SHOULD NOT appear anywhere except on the outside of the envelope & the 1st page of the application form. 2. The applicant SHOULD NOT include anywhere in the application materials names of family members, other relatives, or close friends. The St Wenceslaus Knights of Columbus High School Scholarship will be renewable for each high school year by each recipient of the Scholarship, provided the criteria for renewal are met. The amount of the renewable Scholarship per year will be $500 for each recipient, payable to the Omaha-area Catholic High School that the applicant will be attending in the upcoming school year. The total amount of the Scholarship will not exceed $2,000 per recipient for the four (4) years of high school. 1. The applicant will continue as a parishioner at St Wenceslaus Church, Omaha. 2. The applicant plans on continued attendance in a Catholic High School in the Omaha area. It is understood that this might be a different Catholic High School from that attended by the recipient in a prior year. 3. The applicant will submit, no later than July 15th, each year that they are looking to renew their scholarship, a one-page essay consisting of approximately 300 words describing the applicant’s service- and faith-life in the past year, how the applicant intends to continue her / his journey in faith, as well as any faith-filled moments in the past year that touched the applicant personally. The essay will need to be submitted in a sealed envelope to the St Wenceslaus Parish office, addressed to the Knights of Columbus (High School Scholarship Renewal). The Calendar Club Program has been a game changer for our Knights Council, our parish community, and the Omaha community. Year 3 is in the books and soon we will decide on our charitable acts for 2019. Thanks to all the bought and/or sold tickets this year. We will be back in September for another exciting year. Good luck to all that bought tickets and please pray for guidance and support for our Knights who will be looking to help others. All 1250 tickets were sold. $30,000 in prize money was awarded to various buyers from all over the country. Over $27,000 was given out to various charities under our 4 pillars which the Knights set up. Knights Council 10909 was the lead gift for a 4D Ultrasound donated to Essential Pregnancy Services. We partnered with EPS and the Nebraska Supreme Council to provide women the opportunity to see their babies before they were born. Studies show that 80% of women who see their ultrasound choose to keep the baby. The Knights had started 4 one-time $500 scholarships to 8th graders to help with tuition to a Catholic High School. With the Calendar Club, we were able to offer 4 renewable $500 scholarships to students for every year they attend a Catholic High School. These scholarships are based on their faith, acts of charity, and essays. Our priests are the greatest gift given to us by God. Saint Pope John Paul II wrote in 2004, “without the priest, there is no Eucharist. Without the Eucharist, the Church simply does not exist.” With that in mind, we were able to help vocations and support of our priest in different ways. Contributed to the financial stability of a well-designed vocations camp called Camp Virtus de Veritas. The Knights Council always wants to be of service to our parish community, but also the great Omaha community. This year we were able to help several local charities by giving them approximately $400 to help in their ministries. We selected in 2017 to help 15 different organizations that had been the St. Wenceslaus Charities of the Month. Over $28,000 was given out to various charities under our 4 pillars which the Knights set up. Knights Council 10909 again helped Essential Pregnancy Services this year. We were able to support financially, physically, and spiritually to the construction of a chapel at their Maple Village Location. New this year, we supported the building of two new homes in Iraq for Christians under persecution there. To see more, click here.